Here’s a hot topic with a lot of BMW owners,,,,this car came in with check engine light on and engine whine and rattle noise,,,,check engine light was low oil pressure and jammed oil pressure ,,,,,I noticed the timing chain whine but the engine was also rattling,,,,I removed the valve cover to inspect the timing chain,,,,you can see the chain rail missing and jammed under the vanos unit. So I removed the oil pan to see what’s going on inside and this is what I found at the bottom of the oil pan,,,,there was so much plastic from the timing chain rail,,,there was also a broken bolt and metal shavings in the pan. 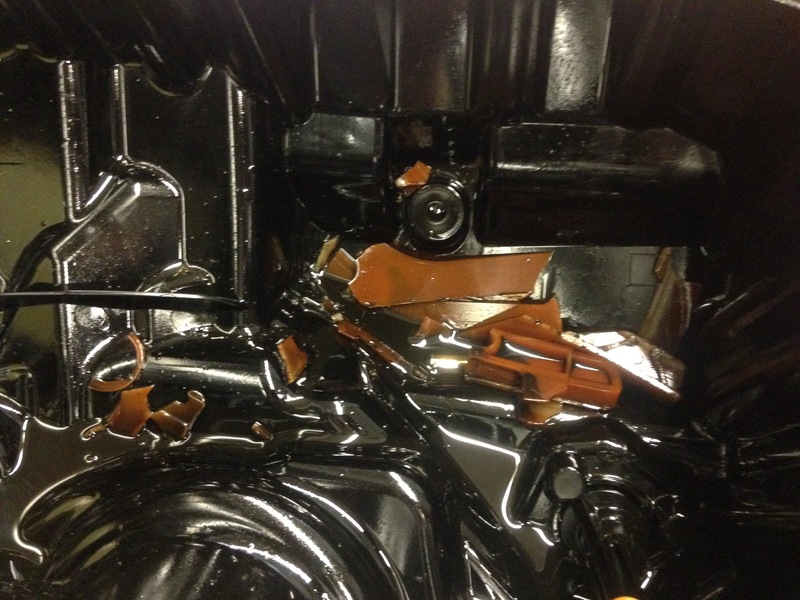 There was so much plastic in the oil pan that the oil pump was sucking up pieces of plastic causing a oil pressure issue and causing more damage. 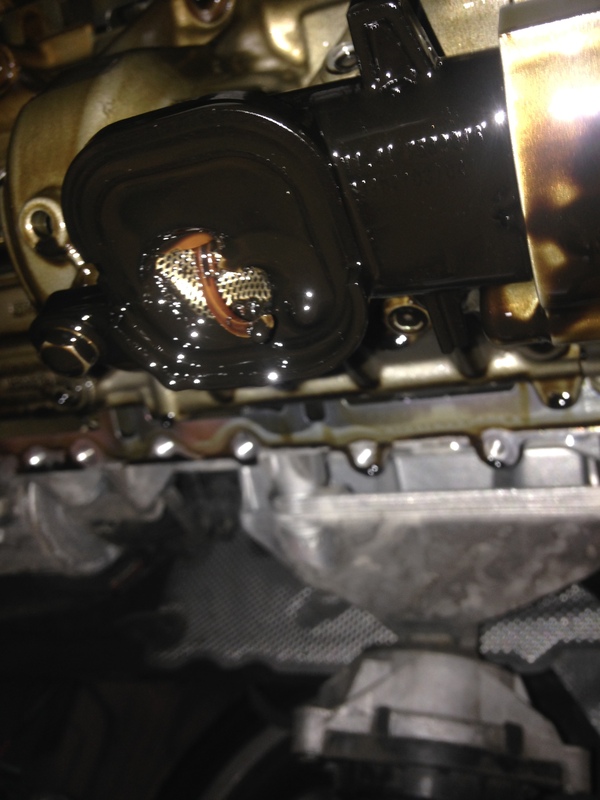 This entry was posted in Uncategorized and tagged damage, N20, timing chain. Bookmark the permalink. Same issue as with the old BMW 4 cylinder engines N46 and N43, when they became older. timing chain issue and oil pressure loss because of this. I know, be glad, these engines are mass products in germany and they have a lot of problems with the timing chains. … Merry Christmas from Bünde, Germany …. What year and mileage? Was it covered? Thanks. First off, Merry Christmas and thanks for running this blog. I have a 2014 328i GT with an N20. Currently 89000 miles, always dealer maintained. This is well outside of the recent warranty extension. I intend to run the car for another 2-3 years. What can I do to avoid a failure? Or what are the early warning signs? Can I expect my dealer to see any early signs of failure during a regular visit? They have seen the issue on three x3’s, but not other models as of yet. Merry christmas ,,,there really isn’t anything you can do to stop failure,,,,the early signs is the whine noise the timing chain make when it starts to go bad,,,,also there might be a chain rattle during morning start up. is it really covered under PZEV warranty? This is part of the covered emission parts? BMW should really have a recall on this, which can be a safety if the timing chain busts in the middle of traffic. I replaced the tensioner which is easy and anyone can do it and probably worthwhile. Likely the chain loses tension from wear on the links and the tensioner weakening (I know its oil pressure assisted)causing slap and breaking the plastic guides as well as rubbing off the block creating aluminium filings. Out of interest what’s the highest mile successful n20 engine you have seen that has not needed repair to it’s injectors, timing chain or oil pump? I would presume all have needed turbo replacement at some point.Most seem to last around 40000 miles. Do u think replacing tensioners is a good preventive maintenance? My 2014 328GT just flipped over 90,000 miles. The only major repair, covered under warranty, was a starter replacement under 20000. So far, regular BMW service intervals and dealer service have worked. It’s only a single screw in tensioner on the front of the engine. Takes about 10 minutes anyone can do it. It does take a few minutes to compress while pushing and screwing inwards to get it to thread in so no need to panic if it won’t just screw in. My new one had more spring to it than the old one did. It should take a mm or two of slap out of the chain to protect the guides. I doubt Bmw garages would change it but many enthusiasts do every 30k miles as a service item with the oil change. Can’t hurt and only costs around 30. 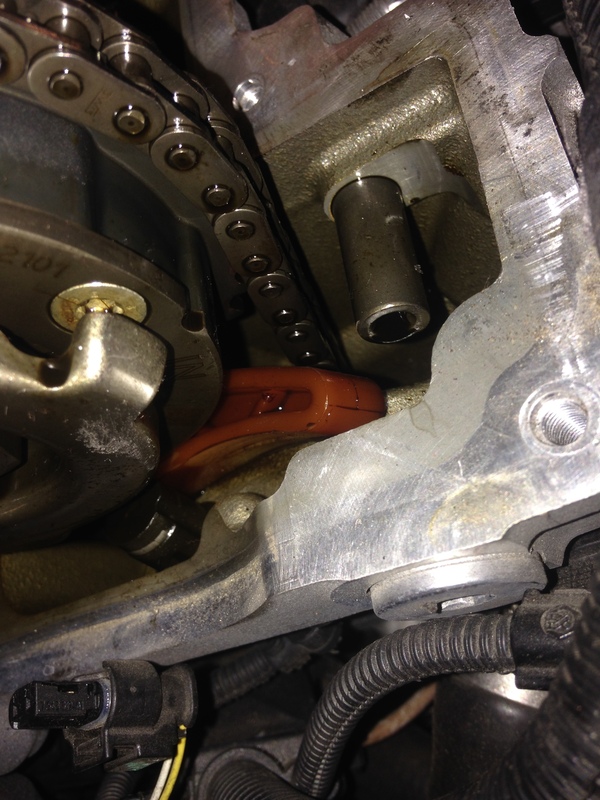 Are you able to do a quick DIY on timing chain tensioner? Or how to remove electric wastegate (do we need to reprogram car after removal?). Also how many cars have you been seen with major timing chain issues? like 1/10, 1/100 etc. How worried should we really be? Apart from the timing tool, do I need any other special tools to replace timing chain and oil pump and chain? Is this all I need or does the flywheel lockout come separately. How many hours do you think it would take as a DIY? Is engine removal necessary? I have a 2014 X1 (E84) xDrive 28i. The build date is 6/2013. Right now the engine is running okay, but I think I see some evidence of rubbing on the chainlinks I see through the oil fill cap. Should I be worried about chain issues? Engine also has 2 or 3 oil leaks, had to go to three different places to get a diagnosis and repair. I put new cardboard on the garage floor, and after a week I see a few more oil drips. The muffler also just developed the butterfly valve rattle, not sure what to do about that. The plastic cover over that area is riveted down in my X1. I can’t believe BMW would come up with such an overly complex design to control ‘drone’ – just terrible mechanical design. I would just keep my hear peeled for the whine noise,,,,that will tell you the chain is going bad,,,the muffler rattle you can live with,,,,not hurting anything just noisey. Okay, I am going to have my local indy shop look at the muffler tomorrow. I might just have them weld it open. Do I have any options for the timing chain? I have not received any letters or email notices about it. The BMW USA website does not indicate any open recalls or anything. Looking around it looks like the lowest price for a new engine is about $7k. I doubt the local dealer will do anything, they have a poor reputation for service. Yes have your Indy look at the exhaust,,,,,,if it is vacuum controlled you can just disconnect the vacuum line and plug it up,,,,if the flap is electrical controlled you might have to weld it open and disconnect the connector,,,,on the timing chain not everyone needs a new timing chain,,,,only some of them are having problems. Hmmm…I am not sure. My X1 only has 41,000 miles, I’ve only had it for about 6 months and put 4000 miles on it. I had to have my indy fix the oil leaking from the oil filter gasket, oil filter housing gasket, and the oil pressure sensor switch gasket. I feel like this is too many problems for such a young vehicle. Thank you for your advice. No one seems to know about this soft “thump-thump-thump-thump-thump” that always happens at 10 mph after a cold start. It does not seem correct that this occurs. Received a 7 year/70,000 extended warranty on the Timing Chain and Oil Pump Drive Chain from BMW in the mail for my 2015 328i xDrive. Is there a recall or anything for bmw f10 2013 528 n20?? I have a 2015 x1 xdrive 28i. No whine or noises as of yet. About 80k miles on it. Do you know if this model has the updated part for the timing chain? f30 320i n20 prod.date: 2013-07-31 [model year 2014] also? Do I really have to remove differential to remove oil pan ? No way to get oil pan out without lowering front axle? How many hours/days does it take you to perform whole fix ? I will just x 3 my time. Does this TC issue throw a CEL? And do owners with this failure use the auto-stop start feature? Does frequent engine start from auto start/stop wear out the plastic rails? It is quite amazing with so many broken plastic pieces, there is still no warning light(CEL) to alert the driver. Oh well. Ive bought all the bits,tools and torque wrenches to do the job. The tools likely cost more than the parts. The new plastic guide rails whilst the new part number look incredibly flimsy where the clip together with the top support, less than 3 mm of plastic and probably less than 1mm thin. Im thinking this is a every 60000 mile job. Just as well I intend on keeping her as like the car and generally never sell. All the 6 cylinder and 8 cylinders are the same way. The other thing is do you think a boroscope can inspect if the plastic is broken later on the new guides through the oil fill cap ,so something do do every x miles? I have a feb 2014 built 420i. Will this suffer the issue, auc warranty finished and am a bit worried. It hard to say if you will suffer the same problem,,,,I would go to your dealer and have your car checked out. I will just replace my chain and guides as preventative maintenance. I have 100k km on my 2013. Still have a year of warranty left. Likely complete this next summer. Very Keen to see a dyi on this as well. What concerns should I have on purchasing a 12’ 328i with 2.0 turbo? I bought the car a couple weeks ago and checked the service records and neither two had been done. It sounds like a possible small rattle at first start but smooth under a load. Has 81,500 miles. The rattle at first start up is normal and should go away after 5 minutes,,,,the timing chain noise is a whine noise and gets loader when you rev the engine. Anything to watch or hear for with the turbo? When measuring the chain stretch with the BMW tool at what limit would it be wise to replace the chain to prevent catastrophic failure. Pin out by any degree or wait until flush per 11 31 540. I have a noisy one but the pin is still out. In all honesty, these are not bad engines. They just require a service that was not scheduled. No one called the M20 junk unless they failed to replace the timing belt before it broke – it that caused muse more severe damage than this chain jumping and busting up the guides. While being a lot more complex than an M10, these crank out a hell of a lot more power and all at the same size. The M10 would wear out at about 80,000 miles and everyone thought those engines were fantastic. Expectations and oils have changed. I have the X1 with N20 engine. When I push more gas I get “limited power” symbol on my dash. Its only under hard acceleration – any tips where to start any common issues that you are seeing ? Sorry I need more information then that,,,are there any faults codes? Hi. I will ask here but in my case it is probably not the timing chain issue. I’m looking for help with the whining noise in the N26 engine 328i F30 from 2015 hear. Two movies below are not mine, but in my engine I hear the same whining noise. My car only have 5000 mileage… Any advise? Any suggestions about the reason for this sound? Thank you in advance. Hi and thank you for your answer. This whining sound can be heard rather when the engine’s revs are falling (drop down between 2000 and 1000 rpm) than when they increase. Warming the engine does not help. Recently, I traveled about 200km and after returning to the garage despite the warm engine, the sound was still present. Of course, when the engine is cold in the morning, this noise can be heard more. Also the guy from BMW checked the timing chain and he told me that there is no problem with it. He also unmounted the belt in order to check the alternator and according to him the noise was still present. I can assume that the alternator and the A/C compresor are both OK. This whining sound is very werid. Sometimes I can hear it only in the morning when the engine is cold and sometimes this sound is present throughout the day. Three more movies (not mine but noise is 100% the same). Not whistling sound but whining when revs drop down. This whining sound can be also heard when the revs are increasing but they can be better heard when revs are falling. Could you please check? Hello, I haven’t seen or heard of 428i with n20 or n26 with these issues…are you aware of any? I have a 2014 428i xdrive with n26. I think it was built 10/2013. I don’t think there are any weird sounds but was wondering if you knew of 4 series having issues. I just bought a 2013 X3 28i 3 days ago as the car was in pristine condition (86000km) and I got an excellent deal on it. After reading all these issues I am concerned. I believe there is a faint whining noise but nothing like the videos posted here. The car is still under warranty until Nov 2019 or 112600 km which ever comes first. I would highly appreciate it if you can answer my questions below. 2- Is there any way I can convince the dealership to cover the cost of replacement of the parts that are defected now before a catastrophic failure happens ? 3- Is this issue inevitable ? I mean it is wide spread across the internet which doesn’t make it rare but does this mean that ALL engines of the same model WILL fail eventually ? Aren’t there any engines of the same model that didn’t fail and done over 200000km for example ? 4- other than changing the parts with the new ones, is there any way this can be prevented ? Final thoughts about taking care of this car so it lives forever 😀 I really like it ! Yes the dealership will cover it if it’s still under warranty and even if the car has not been serviced there,,,,it does help if you have any service records outside of the dealership,,,,no there is no way to convince them from doing it before disaster,,the only way is if they find a problem or if the whine is load enough,,,,no this is not inevitable not everyone has this problem,,,,no there is not preventive maintenance for this problem. If so, this can be easily checked through the oil cap. Hi BMWTechnician, I just bought a 2015 428i and am paranoid about my engine failing due to this timing chain issue. I was previously bitten by the N54 engine issues so am very wary. My cars manufacture date is 04/2015, does it have the new chain and guide parts or do I need to take it in? I know the new ones are supposed to be white but when I open the oil filler cap it appears orange but not as orange as the pics above (could it be just oil coloring the white part?). I can send the pic of it to you if needed. Thank you for your advice! Helps put me at ease. Good news ! I took the car to a scheduled recall and when I was there I told the dealership to check the engine. They got back to me saying there is a problem with the timing chain which is covered under the warranty. 1- will they use the newly designed parts ? will this eliminate the problem ? I really plan to keep the car for at least another 100k kilometres. Is this price reasonable ? Yes they will use the new updated parts 👍,,,this will eliminate the problem,,,and yes do the drive belt and tensioner that a normal price. Thanks mate. You have no idea how helpful you were. I have been reading through this thread and have the same noise as Mike who posted in November. The noise I am hearing is a deep ‘diesel’ like noise which has only occurred in the past couple of days, my car is going into the shop next week as I think it may be timing chain related. It only happens when the car has first started and the throttle is jabbed. That doesn’t sound good,,,,,sounds like timing chain issue,,,I recommend to not drive the car,,,,sounds like the timing chain is getting ready to break at anytime causing severe engine damage. So I have a 2013 BMW 528xi and the car is in “limp mode” and I error code P10F3. Also what kind of scanner can I purchase that give me genuine bmw codes? Hi bmwtechnician, I have a 2013 X3 28i that has 65,000 miles on it. Recently the “drivetrain malfunction” warning light came on a few times, with the latest one accompanied by a slight shudder of the car. I brought it right into the BMW dealer for diagnosis. They came back saying that the car needs a new engine ($12,000 or so) because of low oil pressure issues. They are blaming the local service shop where I got my last oil change for breaking off the oil filter “stem” or housing piece, causing damage to the engine and resulting in metal shavings in the oil filter. I have read up on the timing chain problems and I am wondering if they are equally as likely to be the issue? It also sounds like the oil filter housing issue could be a BMW design flaw by using breakable plastic parts for a critical piece like that. I am at my wits end having to come up with $12,000 to replace an engine on a car with 65,000 miles on it! Am I justified in my suspicion that they are trying to pass this off on me when it could easily be a BMW design problem? Thanks in advance for your advice!